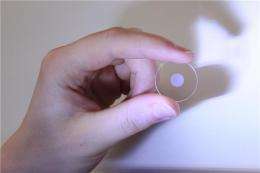 (PhysOrg.com) -- University of Southampton researchers have developed new nano-structured glass optical elements, which have applications in optical manipulation and will significantly reduce the cost of medical imaging. In a paper entitled Radially polarized optical vortex converter created by femtosecond laser nanostructuring of glass published in Applied Physics Letters, a team led by Professor Peter Kazansky at the University's Optoelectronics Research Centre, describe how they have used nano-structures to develop new monolithic glass space-variant polarization converters. These millimetre-sized devices generate whirlpools of light enabling: precise laser material processing, optical manipulation of atom-sized objects, ultra-high resolution imaging and potentially, table-top particle accelerators. They have since found that the technology can be developed further for optical recording. According to the researchers, at sufficient intensities, ultra-short laser pulses can be used to imprint tiny dots (like 3D pixels) called voxels in glass. Their previous research showed that lasers with fixed polarization produce voxels consisting of a periodic arrangement of ultra-thin (tens of nanometers) planes. By passing polarized light through such a voxel imprinted in silica glass, the researchers observed that it travels differently depending on the polarization orientation of the light. This form birefringence phenomenon is the basis of their new polarization converter. The advantage of this approach over existing methods for microscopy is that it is 20 times cheaper and it is compact. "Before this we had to use a spatial light modulator based on liquid crystal which cost about £20,000," said Professor Peter Kazansky. "Instead we have just put a tiny device into the optical beam and we get the same result." Since publication of the paper in May this year, the researchers have developed this technology further and adapted it for a five dimensional optical recording. "We have improved the quality and fabrication time and we have developed this five dimensional memory which means that data can be stored on the glass and last forever," said Martynas Beresna, lead researcher for the project. "No one has ever done this before." The researchers are working with the Lithuanian company Altechna to introduce this technology to the market.